My love and hate relationship with food! October 21, 2015 by AdoremydietLeave a Comment on Smoothie yourself beautiful! Banana, plum, strawberry and oat milk smoothie. Banana, Plum, Strawberries and Oat milk! I just had to write a short something about this smoothie I had the other day, it really was gorgeous and was literally thrown together with not much thought. See I love that about fruit, the fact that you can throw a few ingredients together and you never know the flavours which will come out! I obviously had to add a banana for thickness, I think had I not it would’ve been a little bit like a slushy because of the frozen strawberries. The frozen strawberries were just the most delicious aspect and gave it that gorgeous colour. The oat milk for me just makes the whole smoothie creamy and I usually hate that but I for some reason enjoyed it this time which has got me thinking what other smoothies I can create!! – 2 Plums- peeled & stone discarded. – 6 Big (ish) ripe frozen Strawberries. Place all ingredients as shown in picture above and turn on blender…done! I am on the hunt to find not just a good smoothie, but a great smoothie! 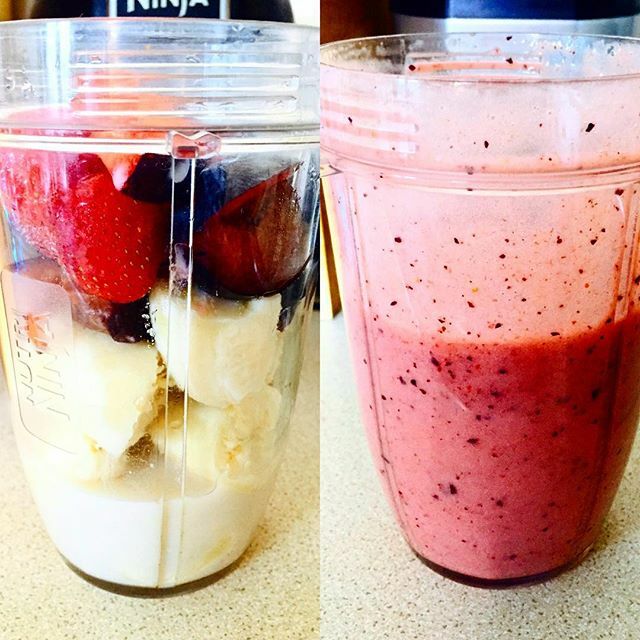 May 1, 2015 May 1, 2015 by AdoremydietLeave a Comment on Smoothie with my oats? I ate my oats first and then finished with my refreshing frozen strawberry and banana smoothie! Kiwi fruit & blackberries make the world a sweeter place! April 28, 2015 April 28, 2015 by Adoremydiet2 Comments on Kiwi fruit & blackberries make the world a sweeter place! Today I had a gorgeously sweet toothed breakfast that consisted of beautifully sweet frozen blackberries that were huge, kiwi fruit that was so ripe it literally melted in my mouth and a sprinkling of banana chips! I finished it off with a few nuts and lashings of almond milk over oats! I feel like my appetite has been fulfilled and I now wont be hungry until lunch! Its a blueberry affair today! April 27, 2015 April 27, 2015 by AdoremydietLeave a Comment on Its a blueberry affair today! Breakfast today was blueberries and oats! I also did a dry mix of cinnamon and ground almonds to sprinkle over my oats, it tasted spot on! Blueberries taste gorgeous when fully ripe and are good for you, what is not to like about that!! A typical breakfast for me using superfoods.